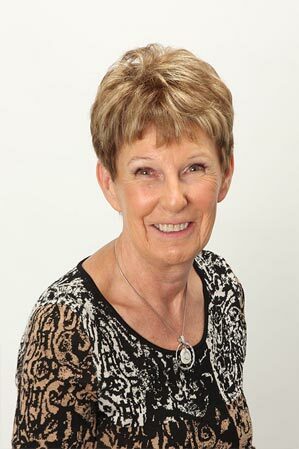 Hi, I’m Diane, the owner and manager of Larson’s Service and thought you might enjoy knowing a little bit about our shop and the team that will be servicing you…..
as both C1 Service Consultant & G1Auto Maintenance & Light Repair. 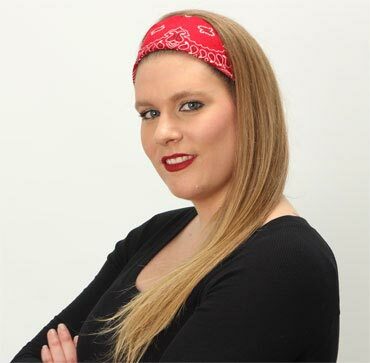 She graduated with AAM (Automotive Aftermarket Manager) and AMAM (Automotive Masters Aftermarket Manager) from Automotive Management Institute, along with her AAP (Automotive Aftermarket Professional) from Northwood University. She’s been in the Automotive Business since 1990, when she joined her late husband John, to help run our neighborhood shop, which has been successfully established for over 25 yrs! 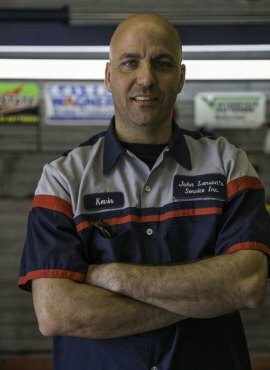 John was a very talented mechanic, and great guy:), who loved fixing cars. He worked his younger years in GM dealerships, until we started out on our own. Starting out with no money, a dream, ambition, we both worked very hard to build our business. 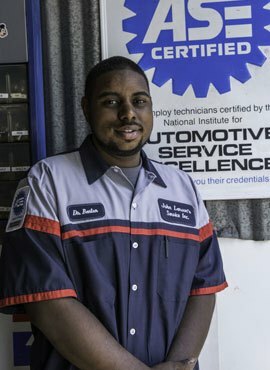 We continued to learn, John went on to become a top-notch Technician, while Diane learned about cars and how to run the business. We had great days, hard days, tears & smiles:) and loved what we did! In 2007 John got sick and passed away in 2008 at the age of 56, from complications while awaiting a Heart Transplant. I lost my business partner, top technician, beloved husband and best friend…We all lost a great, great guy! In September of 2008, we hired another full-time tech to work with Kevin, who mentored under John. While Diane won a scholarship to further her automotive education. By winter, it was evident that we needed someone else, in addition to our 2 young technicians, to fill John’s void. In January 2009, we added another employee, with the mechanical experience we needed to round out our team. January 2011 brought us smiling Taylor, who was a female looking to excel in the Automotive field, she joined our team as an apprentice and has continued to thrive, learning all aspects of the shop! Our TEAM rocks and look forward to taking care of YOU and your vehicles. My name is Taylor I have been here at Larson’s Service since January 2011. I have always been interested in cars and the Automotive Field but never had a lot of encouragement to pursue this kind of Career. I attended an Adult night school for Mechanics and Auto Body and worked on all my families’ vehicles with my Father growing up but never really knew how to get my foot in the door for anything further. Then I read a Newspaper article on Larson’s Service being a female friendly shop and having a woman owner. I was so intrigued by this I had to go talk to Diane to see if she knew how I could get my career started. Needless to say that is why I am here today and since then I have become very well rounded in the industry from doing Technician Work to Service Writing and Administrative Work. I have graduated with my AMI (Automotive Management Institute) Bachelors & Masters degree, I am also ASE Certified with my C1 Service Consultant and AskPatty Certified. I have been working hard to hold up to my business card title “Aspiring Shop Owner”. Aside from Automotives I’ve been known to enjoy things like Camping, Off Roading, Kayaking, Fishing, Listening and Playing Music and Dancing, but my absolute favorite thing to do with my down time is going on adventures with my wonderful son. 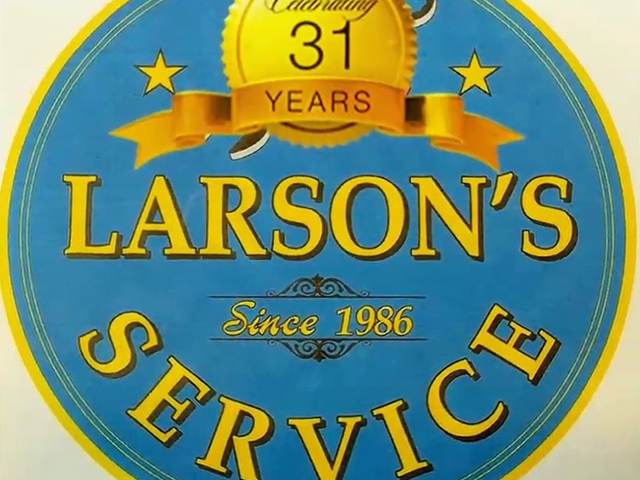 My name is Kevin I have been with Larson’s since 2001. I have always had a passion for mechanics. When I was younger, I started out by fixing all the neighborhood kids bikes. As time went on I started helping with the maintenance of lawn mowers, snow blowers, and cars, for my friends and family, it just came naturally for me. In high school, I also started to enjoy carpentry and went to school for it. I worked in the carpentry industry for a while after high school. After meeting Diane and John I knew I belonged in the automotive industry and became an apprentice under John for 7 years before he passed and learned I everything I know from him. Now I am the shop manager/foreman. I am always staying up to date with training and spend a lot of my free time watching car shows and YouTube videos on the latest and greatest features and upgrades in vehicle. One of my other favorite past times is traveling with my wife and daughter. My name is Brandon I have been with Larson’s since March of 2013, I am a Toyota & ASE Certified technician. I started working at a Toyota dealership in 2004 while working at the dealership, I started at UTI (University Technical Institute) in 2007 and specialized in Toyota & vehicle Performance. I worked at Toyota dealerships from 2004-2012. In 2012 to 2013 I tried my hand at a Hyundai dealership. After years of working in dealerships I found Larson’s to be a breath of fresh air, the mom and pop shop with a professional business model was just the right fit for me. Even when I’m not working, cars are one of my favorite past times but nothing compares to spending my time with my wife and 3 kids. 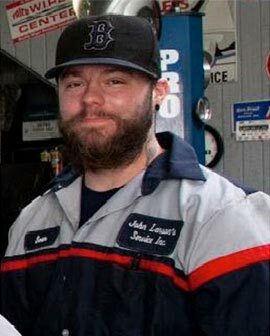 My name is Sean I have been with Larson’s since September 2015, I started out my career in the automotive field as a tire specialist from 2004-2007. In 2007 I started working at a machine shop because I also found an interest in that field as well, but ended up finding my passion for automotive field to be greater. I started working at an independent shop during the week in 2013 and I also started working at a chain store as a tire specialist again during nights & weekends, until 2015 when I found Larson’s, where I was hired on as a technician apprentice and have been learning the in’s and out’s of what it takes to become a certified ASE Master Technician. I am staying up to date with classes and training in order to start acquiring my ASE Certifications soon. When I’m not working, I am a pretty big sports fanatic. I love watching and staying up to date on all my Boston teams and playing football and Basketball, I also enjoy spending time with friends and my daughter.